Guilty Gear Xrd: REV 2, the expanded follow up to Guilty Gear Xrd -REVELATOR- has arrived! Choose from your favorite fighters, or try out some of the new contenders as you battle for glory! New fighters, modes and polished mechanics provide infinite ways to annihilate your rivals! One of the greatest fighting game series just got better. 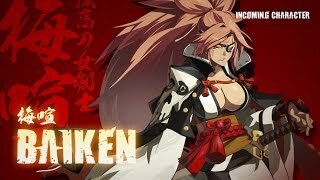 Baiken and Answer join as new playable characters! Existing characters have been further balanced and tweaked, including new techniques! Brand new story line scenarios. New episodes have been added for Baiken, Answer, Dizzy, Jam Kuradoberi, Kum Haehyun, and Raven. Major improvements to the online modes in the game. Early purchasers will get a free mini soundtrack. Guilty Gear Xrd: REV2 Balance Patch Out Now for Steam! Guilty Gear Xrd: REV 2 Now Available on Steam!